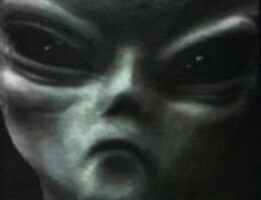 The greys are the most commonly identified alien race in UFOlogy and the alien abduction phenomenon. There are many different views, stories and theories concerning them ranging from the different New Age views to the different Scientific, and conspiracy theorist views. The Greys are the most commonly described race by abduction victims. In this view they are considered a race with an unknown motives, and agendas. They seem to be abducting, studying, testing and using various individuals, usually recorded following family trees for their unknown reasons. In the new age movement the Greys are often associated as an evil race, or a race with bad energy. Due to the methods of acquisition of abductees, the race is feared by many of those who are selected. They are often associated with other races, such as the Reptoids whose reasons are also unknown. The different conspiracy theories are often a mix of the scientific and new age views. The standard conspiracy base states that the Greys crashed one or more of their space ships, one in Roswell, NM in 1947. The US Government recovered them, and have reverse-engineered the technology to bring about most of the advanced tech that we have today. 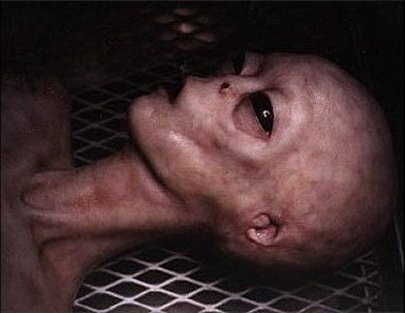 The Government then made a secret treaty with the Greys allowing them to abduct human beings in exchange for more advanced technology. Their are descriptions of several types of Greys: they are all humanoid in appearance, an almond-shaped head, two large black lidless eyes, two arms, hands with no thumbs, legs, and feet. Small mouths and nostrils have been noticed as well. All tend to appear greyish in color, either their skin color or some form of clothing. Their name is obviously representative of their description. The most commonly seen grey is around two to four feet tall, very slender and delicate looking, they are small beings and light weight, extremely penetrating black slanted eyes with no pupils, almost vestigial mouth and nose, a very large head with a pointed chin. The skin color varies from dark grey to light grey, tan to tanish grey, white to pale white. They have no hair on their bodies. There have also been many report of cross breeds that are both human and grey. These are explained as hybrids, a cross between the races. They have more of the physical appearance and physical strength of humans, however much broader powers of the mind. This creature has been seen on the island of Puerto Rico as well as in the southern United States and is said to be responsible for numerous animal mutilations. It has been called the "Chupacabra" since the first animal found dead with mysterious marks on its body was a goat completely drained of blood. The name in a rough translation means goat sucker. The Chupacabra is described as a short, agile creature with a large head and eyes closely resembling those of the greys. This has lead some to believe that they may be genetically related. Protruding fangs and a long, pointed tongue are used to kill animals and drain them of blood through small puncture wounds on the neck. The skin is mottled with green/yellow/black patches and is said to have chameleon like qualities. Folds of skin on its back and arms help it move along the ground at great speed and maybe even glide for some distance. It has three clawed digits on each hand and foot. Though the creature is intelligent as it has managed to evade capture for many years, it probably is not sentient and unable to manipulate tools. Reptoids or Reptilians are said to have several underground bases on Earth. Various bizarre reports can be found on these entities. There are some theories that suggest the Shoemaker-Levy 9 comet that impacted Jupiter was actually a Reptoid invasion fleet that was thrown off course by a "friendly" alien race to save Earth. 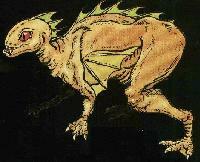 They are described as being tall, 6 to 8 foot bipedal creatures with scaly, green, reptilian like skin. The large eyes are usually yellow or gold in color with a vertical pupil. It is interesting to note that this entity is similar to what the dinosaurs may have evolved into had they still been around. Hybrids are supposedly the result of selective breeding between Grey extra terrestrials and humans. The Greys remove ova and sperm from humans and combine Grey DNA with the DNA from these human samples to create the Hybrids. The reason why Hybrids are created by the Greys vary among researchers: to create a 'superior race' combining the best aspects of human and Grey traits, to save the Greys from extermination due to excessive use of cloning, or to save us by transplanting the human species to far-away planets because our society is on a path toward self-destruction. The are usually described has looking very similar to human beings. They have a thin build, a high forehead and the head is slightly larger and rounder than a human's. Very human looking, some say that if you were to meet one on the street you wouldn't be able to tell the difference. They are called Nordics or Blondes because they are tall (6 to 7 feet), have blond hair and fair skin. 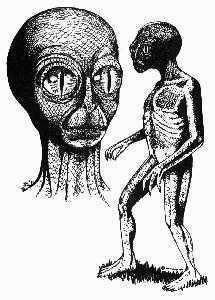 This type of alien is most intriguing since it suggests that the human form is not native to Earth or that we may have common ancestors. There are many contactees and abductees (e.g. 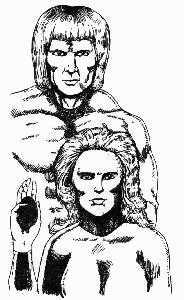 Travis Walton) who have reported seeing these aliens operating together with other alien species.